The UCR-40 features the new TranzX M16 GT Middle Motor delivering Hi-torque performance through the bottom bracket and incorporating CanBus/Logix computer diagnostic capability which gives more efficient and accurate information for your EBCO service dealer. Featuring our new headstock comfort suspension fork a 400wh lithium ion battery that will take you between 30-50 miles and fully equipped with everything you need for miles of trouble free enjoyable e-cycling. Available in a traditional Roadster frame style with a comfortable upright riding position. Sizes M.L. Finished in Matt Verdigris. 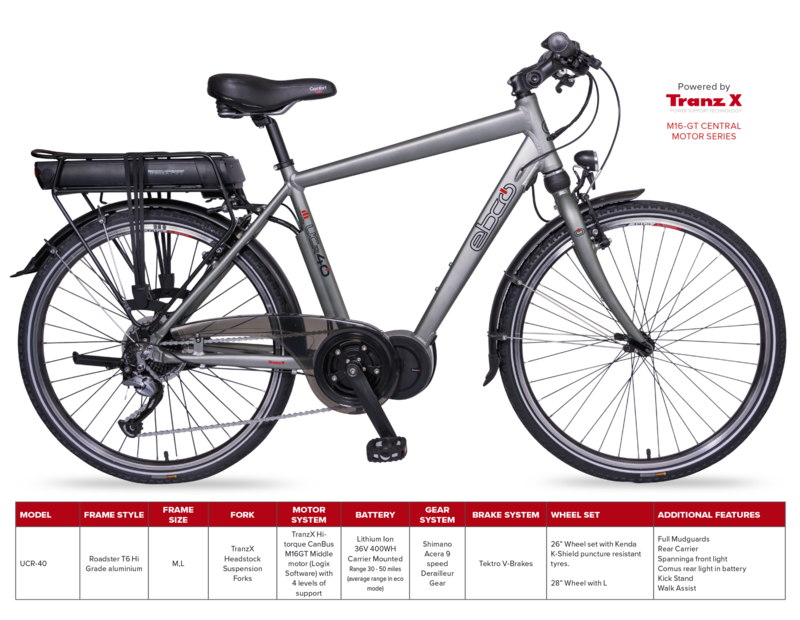 A quality Mid Motor e-bike at a competitive, affordable price. Urban City Traditional Roadster frame with Headstock Suspension Forks built in T6 high grade aluminium giving a stable and comfortable riding experience. 26″(M) and 28″(L) wheels fitted with Kenda tyres featuring an Iron Cap puncture resistant K-Shield belt and reflective side walls. TranzX PST 250W 36V brushless high torque M16GT middle motor with an integrated RPM sensor, precise motor controller and DP27 LCD display screen with 4 power support modes and walk assist giving a smooth controllable riding experience. Shimano Acera 8 speed derailleur with Acera Rapidfire plus trigger shifters for more precise and easy gear changes. Freewheel: Shimano Cassette 8 speed 11-34TPedals: VP resin comfort pedals, 9/16\\\\\\\\\\\\\\\\\\\\\\\\\\\\\\\\\\\\\\\\\\\\\\\\\\\\\\\\\\\\\\\\\\\\\\\\\\\\\\\\\\\\\\\\\\\\\\\\\\\\\\\\\\\\\\\\\\\\\\\\\\\\\\\"